Like a piece of music, a dinner party has rhythm. Rhythm suggests movement. A good dinner party has a smooth, forward motion– an interaction between food, service, hosts and guests. There are guides aplenty promising never-fail game plans to the successful dinner party. And truly,…small gestures do convey messages of generosity and welcome—refilling glasses…making sure everyone is ready to move on before removing the plates for a course change…listening to people. But, also like a well-played piece of music, getting the rhythm of an evening right is not primarily about rules but feel. Nobody gets all the parts moving along together in harmony every time, but that’s what we aim for…that nice forward motion that neither rushes to nor drags along to the evening’s end. 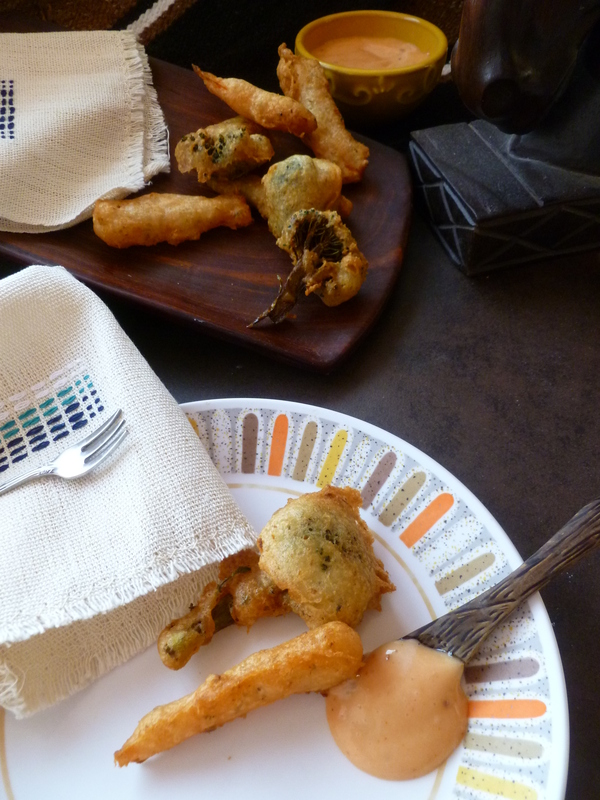 Caper and Scallion Beer Batter Fried Carrots and Broccoli with Sauce Aurore are part of the evening’s overture in the diplomatickitchen’s Alpine Dinner. 1 head of Broccoli, divided into fleurettes: Cut large ones in half. a large Baking Sheet or Pan lined with Brown Paper Grocery Bags or Paper Towels: Brown paper grocery bags drain deep fried food more efficiently than paper toweling. 1. In the mixing bowl, whisk together the flour, beer, scallions, capers and salt. 2. 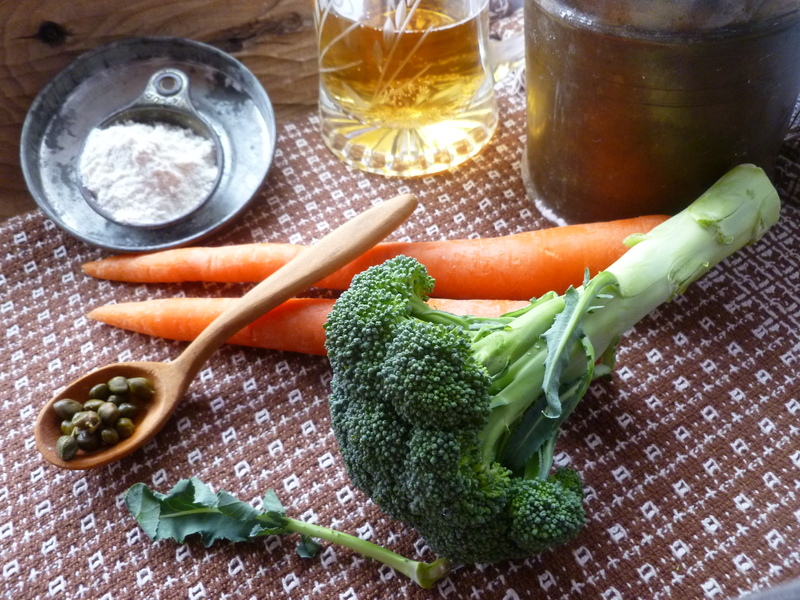 Pour enough oil in a heavy, deep-sided pot so that the vegetables will float freely as they fry. Heat the oil to 375 F.
3. 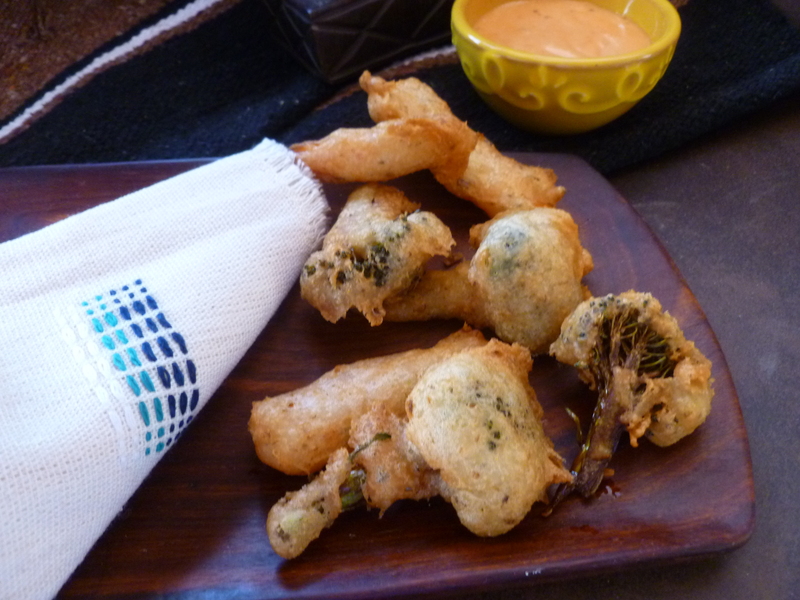 Fry the broccoli first, dipping fleurettes in the batter and frying them in a few at a time for 3 minutes or until they are golden. (Frying too many at once lowers the oil’s temperature and the batter coating will absorb more oil as the vegetables fry.) Transfer the pieces of broccoli to drain on brown paper or paper towels. 4. Dip the carrots in the batter and fry them, a few at a time, at 375 F, for 2 minutes. 5. 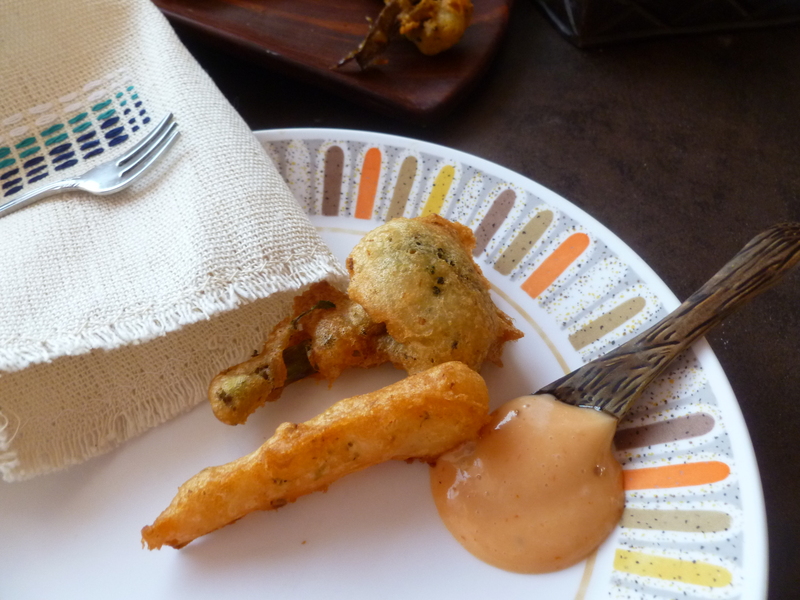 Arrange the batter fried vegetables on a platter and serve hot with a bowl of Sauce Aurore alongside them. 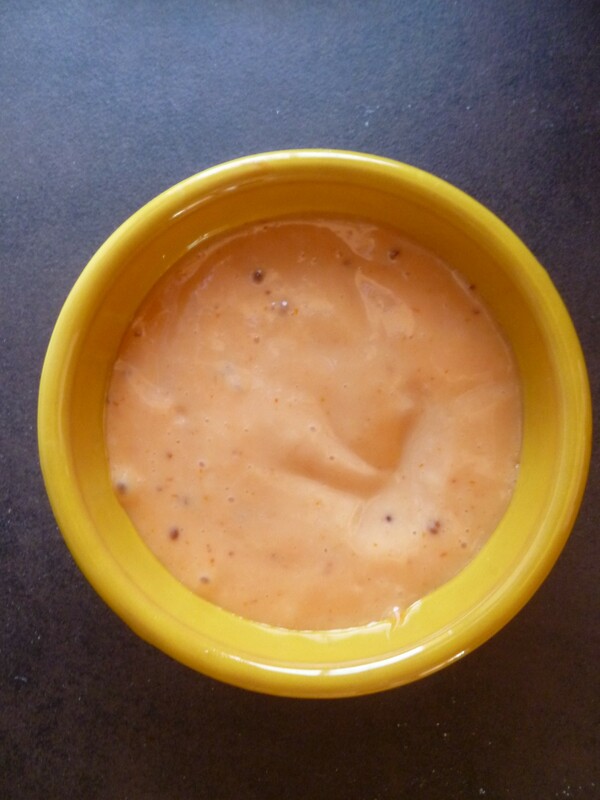 Sauce Aurore (for about 1 and 1/2 cups): Sauce Aurore is a simple combination of mayonnaise and ketchup. 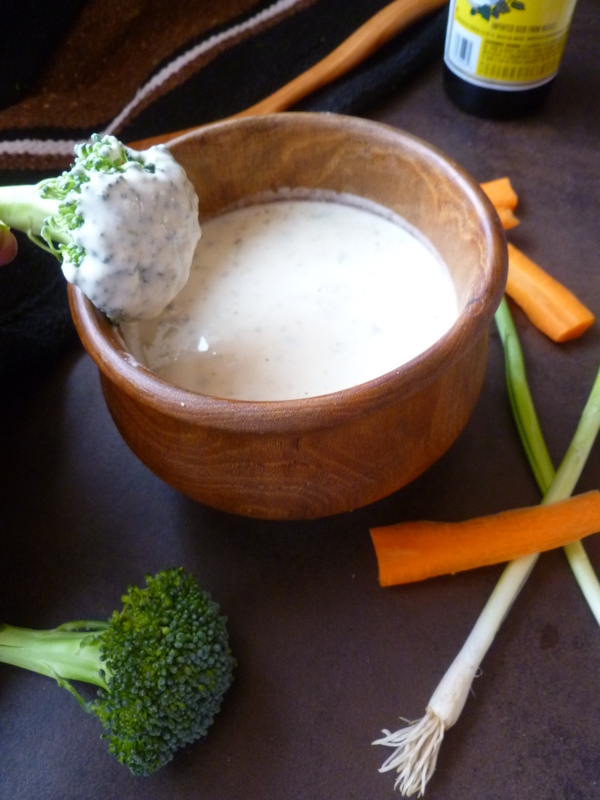 Homemade mayonnaise makes it a very fine sauce. A ‘Hand’-y Option: If you are using a hand mixer, you may place some ice in one large mixing bowl and place a second, slightly smaller bowl inside it. Place the ingredients in the bowl over ice and follow the recipe below. The ice chills the bowl in which the mayonnaise is mixed and aids the emulsion process a little in my opinion. an Electric Mixer: I find a hand mixer more convenient for making mayonnaise…but this is a matter of personal preference. 1. Put the mustard and water in the mixing bowl. Add the egg yolks, salt, cayenne and the vinegar. 2. Beat until the mixture is well combined. 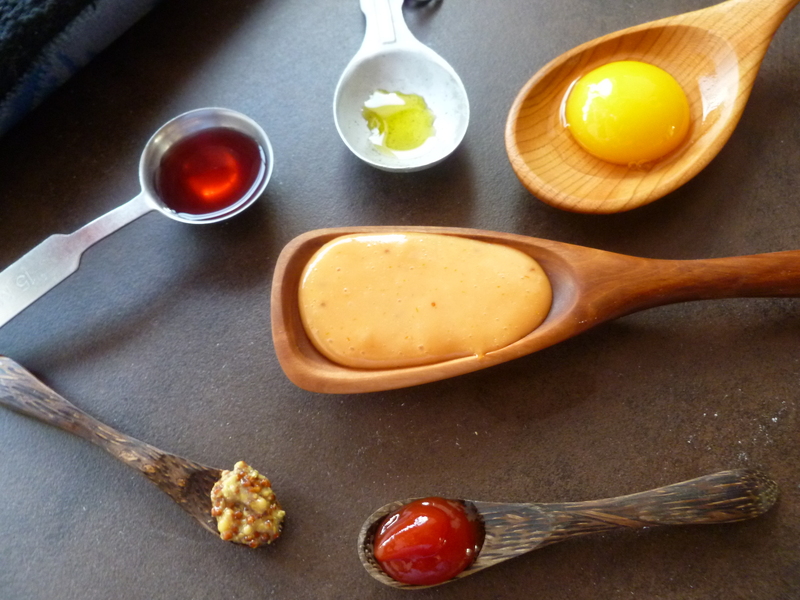 Add a few drops of oil and continue beating until the oil begins to form a stable emulsion with the yolk mixture…i.e. the oil and yolks will not separate when they are no longer being beaten. This may take some time…The mixture will start to thicken and cling to the sides of the bowl. When you see the beginnings of this change in the mixture, add a little more oil, continuously beating. 3. Keep beating after the new addition of oil until the mixture thickens perceptibly. It will begin to form thick ribbons of sauce around the sides of the bowl as it is beaten rather than sliding back down into it and collecting there in a thick, liquid form. (Waiting for this change in the consistency requires a bit of patience. The mixture will become creamy before it actually thickens.) Once it does begin to thicken as described, gradually add the remaining oil, a little at a time, mixing each new addition of oil in completely before adding more. 4. When all the oil is added, taste and add additional salt or cayenne to taste. 5. Whisk in about 2 Tablespoons of ketchup…or enough to tint the mayonnaise a rosy-pink. 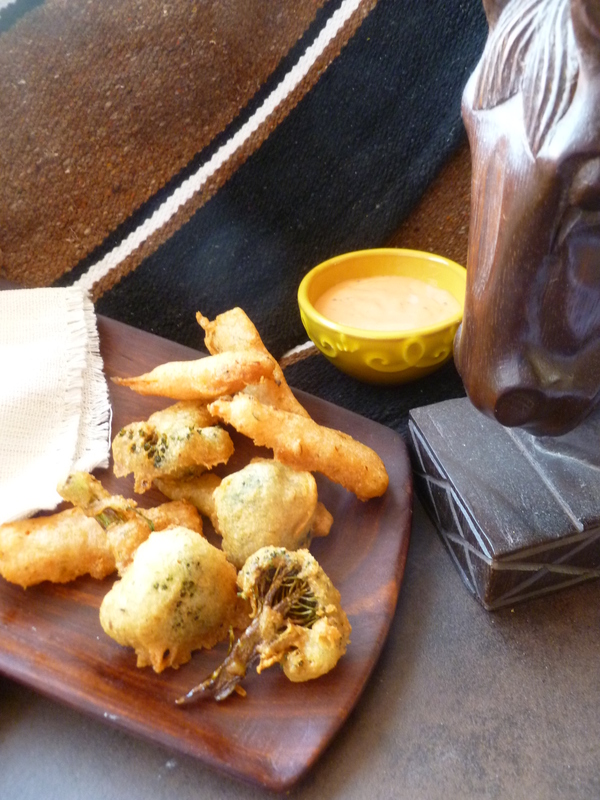 A Note: Caper and Scallion Beer Batter Fried Carrots and Broccoli with Sauce Aurore is served with drinks before the Alpine Dinner Menu. 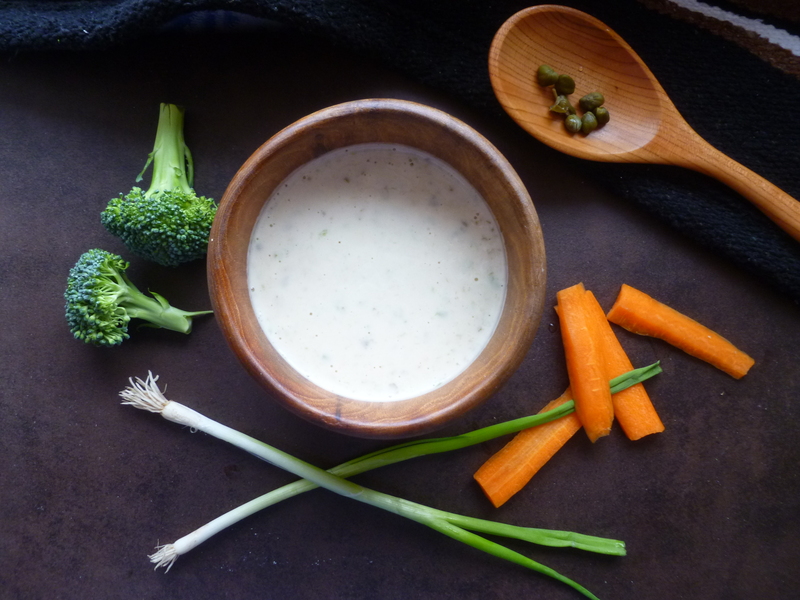 The recipe for the mayonnaise used to make Sauce Aurore is adapted from one in The New York Times Large Type Cookbook (1985) by Jean Hewitt, a former food writer for The Times who was responsible for the planning and opening of its test kitchen in 1969. This out-of-print cookbook, which unfortunately is not available to read online, is a source of many good recipes. Huh? Isn’t mayo and ketchup fry sauce? While aurore sauce is tomato paste/puree and bechamel/cream? Dear Karina, Absolutely right. The latter set of ingredients you list does make a Sauce Aurore. At the same time, many French cookbooks/journals/websites give recipes for a sauce with mayonnaise and katsup and give it the same name…Sauce Aurore…I suppose the common element between the two sauces is the pretty color and ‘Aurore’ is descriptive of it. Many of the French recipes for the mayonnaise version include a little Cognac which would probably be a good addition.